There is much to love in the third book of Peter Newman’s “The Vagrant” trilogy. As in George R R Martin’s and J R R Tolkien’s epic fantasies, there is world building. We see the silver steps towards the sanctum of The Seven, the monument of seamless metal fifty feet high and ending mid-air, and the vast floating cube of the sanctum aloft. We see Vesper's home bounded by goats and two brick buildings, one lopsided. As in Martin's and Tolkien's worlds, there is the magic of language: the language of the sword, the language of hymn, the language of silence in the mute Vagrant. These devices of world building and use of language work well for lovers of the fantasy genre and add to the strength of the book. 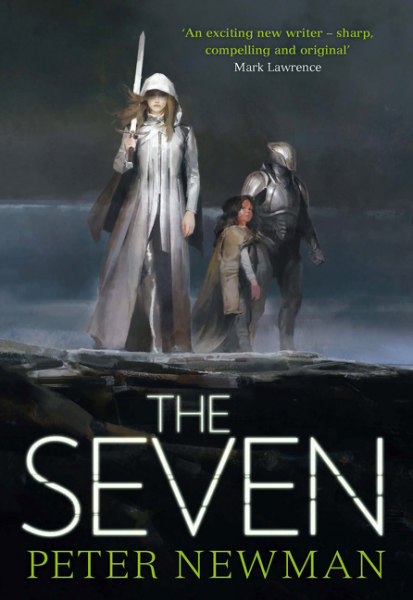 There are creatures of all form in this post-apocalyptic fantasy… Now that the battle with the infernals is over, there is a formidable foe, once protector: The Seven, awoken and thirsty to purge against the tainted. The lone problem is that fine people exist among the tainted, like Jem the spouse of the Vagrant's daughter; like half-breed Reela, Vesper's own daughter. Unlike the first book of the trilogy, where the Vagrant sought to restore the vanquished Gamma's sword to The Seven; and the second book, where his daughter Vesper took ownership of the Malice; in the third book, there is a second sword, one that hums for Delta. Who will it summon? The book is about the immortal Seven, now awakened from metallic sleep. We find Alpha, Beta, Epsilon: the brothers; Delta, Theta, Eta: the sisters, who have lost Gamma to the encounter with the infernals. But with the Breach sealed, and Vesper a leader, keen to reach out to the colonies, what onus remains for The Seven? Led by Alpha, their mission is clear: the purging—to cleanse the world from the tainted. The Vagrant must take Delta—one of The Seven—hostage. But Delta has her own sympathies, and a diverse perspective from her brother Alpha on the purging. The Seven are in discord. The story flits between past and present, back and forth to over a thousand years ago, to Massassi and her creation of The Seven, to Peace-Fifteen morphed into Obeisance. There are fascinating elements of fantasy at play, like half-breeds sired by the tainted. Like The Seven's language of song that unleashes massacre. Like Delta's tears of stone. But there is also much not to love in the third book of “The Vagrant” trilogy. Peter Newman doesn’t quite immerse you in his odyssey. The impersonal nature of the narrative does not invoke connection with the reader. The author's unique style renders it somewhat intricate to engage with. Dialogue is mostly unremarkable and characters leave you underwhelmed. There are a few robust characters, though, like the skydiving Alpha, whose song bears the potency of a fire dragon's breath; the sword-wielding Vagrant, whose silence is mesmeric; the slumbering Delta of The Seven, whose weary form feeds on snatches of sleep but whose calling is to do right by those she is preordained to protect; the mimicking little Reela, whose attachment to her grandfather, the Vagrant, cartwheels her into constant peril. As the story hits pace, you’re not sure if you like its cast or are oblivious to most of them. But the robust few will evoke in you some sentiment, if not an opinion. The Seven is not always an easy read. Sometimes you need a few takes to understand the text. It is the kind of narrative you love or hate. Sadly, it doesn’t work for me. It comes across as a commercial book with fanfest appeal, the type of speculative fiction Harlan Ellison might abhor. It is ordinary writing that tells a grand story. You will not find Kafka or Wells or Verne or Orwell here. But what you will find makes up for its lacking. You will find much action in the battle scenes involving the purging, fascination in a voiceless vagrant and his feisty offspring, while warming up to moments of beautiful language inside the sharp and unusual style. You will find pace in short, sharp sentences. Action, action, action in present tense and multiple viewpoints. As you cannot help but wonder if the book could have finished on a climax several chapters quicker, one thing you know: fans of demon-ridden, post-apocalyptic stories will savour this tale.